Motorcyclists in Wales are being warned about the ‘high risks’ associated with speeding, as part of a new campaign. On 24 March, Dyfed-Powys Police launched #OpDarwen, an annual campaign which aims to reduce the number of motorcycle-related deaths and serious injuries on the region’s roads. As part of the operation, Dyfed-Powys Police is working with partners to educate motorcyclists and drivers about the risks of excess speed – especially on country roads. Superintendent Craig Templeton, head of specialist operations at Dyfed-Powys Police, said: “Most fatal road collisions happen on country roads and inappropriate speed is one of the main factors. “The national speed limit on single carriage roads is 60mph but you may need to drive under that in order to drive correctly for the conditions. 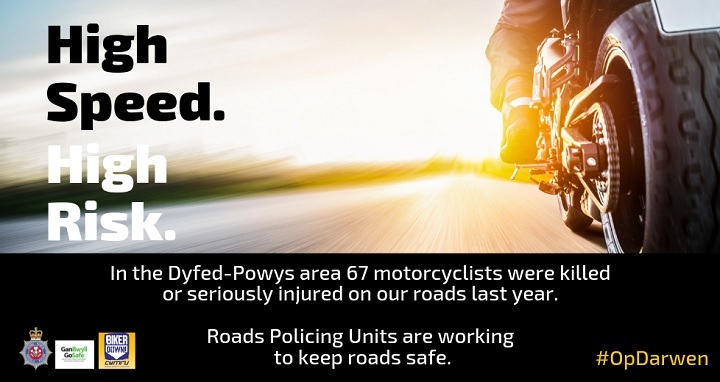 Dyfed-Powys Police is also working to ‘improve outcomes’ when a collision occurs – encouraging riders to book themselves onto a free Biker Down course which teaches riders what to do if they are the first on the scene at a collision involving a fellow biker. Supt Templeton added: “As the weather improves we see more bikers on the roads taking advantage of the stunning routes through Dyfed-Powys. As well as locals, we are seeing more and more visitors coming here to enjoy the scenery. Statistics show that in 2018, 67 motorcyclists were either killed or seriously injured on roads in Carmarthenshire, Ceredigion, Pembrokeshire and Powys. A few years ago The Cat and Fiddle roads was a very dangerous place for motorcyclists and I visited the pub of that name. A stop for bikers. Asking the publican what his thoughts were on what was the greatest danger that created so any incidents on that road and his answer was simply…. wind. He said that coming round some bends on racing bikes in particular that have fairings, that act like sails and a simple gust of wind has blown many a biker off their bikes and off the tarmac. Not speed but in some cases wind in general can affect the stability of bikes but not generally of cars. I can understand perhaps you and many others not knowing these matters but with over some 55 years of riding motorcycles means that one can amass a greater degree of knowledge and understanding. I would think Bob that there is a speed, below which the tyre problems you’ve outlined are not significant, so the message to them about managing speed is still valid. Any motorised vehicle’s speed determines what does, or doesn’t happen next…and also applies to the police as well, which is what I presume David was alluding to. I agree Hugh for many years the answer has been to send police officers out to be pro active with bikers but the theme has always been the same…..lose your speed. This does not engage with some bikers at all and many other road users are also sick and fed up of being fed the same old advice speed, speed, speed etc. I hope that my message can engage with motorcyclists as its something new, different and meaningful, specific to bikes and bikers and perhaps something that they have not thought about. I hope that they use it and that it can work for their safety and the safety of others. Have you ever watched an episode of the fly-on-the-wall style documentaries focusing on the police? Why spend time and effort putting out messages about how bad it is to be in a moving object that is travelling above a certain number on a speedo, when there are constant messages emitted by different limbs of the same body on national television that insinuate that the inverse is good? Such speed-themed road safety messages are falling on deaf ears I suspect – not just bikers but motorists as well. The authorities have to try and be seen to be trying, to get messages across, but there will always be some who ignore it – at their cost and others’. One of the things that they don’t warn motorcyclists about is tyre pressure and the temperature of the tyres. Many riders have day or a ride out into Wales and after an hour or two with the tyres nicely warm and the correct pressure they stop for lunch, tea or a snack. Unfortunately some will stop off at a pub and have a pint with lunch. Afterall one is entitled to just one pint aren’t they? Some time later they set off again as if they had never stopped and fail to realise that their tyres are no longer up to temperature or of the correct pressures. This can also apply after riding for some distance in the sun on hot tarmac and then they hit an out of sun situation, say under trees or other foliage and a colder or even a wet tarmac and that can reduce the temperature and pressure in tyres quite a lot, enough to unsettle the bike sometimes. On the straights it may not be much of a problem but as soon as they hit the bends with colder tyres and less pressure they can come a cropper and off they come. Perhaps the police teams can bear this in mind.